Māori support for New Zealand’s recruitment effort during the First World War varied. Some tribes volunteered in large numbers but from others there was no response at all. This unevenness reflects the varying impacts of colonialism experienced by different iwi/tribes. Iwi who had suffered land confiscations often rejected calls to participate in the war. Recruitment was greatest among iwi traditionally allied with the British Crown in the various NZ wars fought during the 19th century. These tribes included Ngāpuhi and other far northern tribes, Ngāti Kahungungu, Te Aitanga-a-Mahāki, Te Aitanga-ā-Hauiti and Ngāti Porou from the east coast and Te Arawa from the Bay of Plenty. Kaumatua/elders from these iwi encouraged their youth to volunteer and honour their obligations to citizenship and the Treaty of Waitangi. Young Māori Party politicians also supported Māori participation in the war. Te Rangi Hīroa (Peter Buck) (1877-1951) served as a medical officer with the first Māori contingent. He believed that wider patriotism would break down tribal rivalries which hampered Māori development. Buck’s colleagues Maui Pomare (1875/6-1930) and Apirana Ngata (1874-1950) believed Māori must adapt to survive and advance in the modern pakeha/white European world. In particular Ngata believed Māori involvement would win Māori greater respect from pakeha, and strengthen future claims to full citizenship and equal status. Ngata is important because he advocated that Māori would achieve most visibility by serving as an identifiable unit. 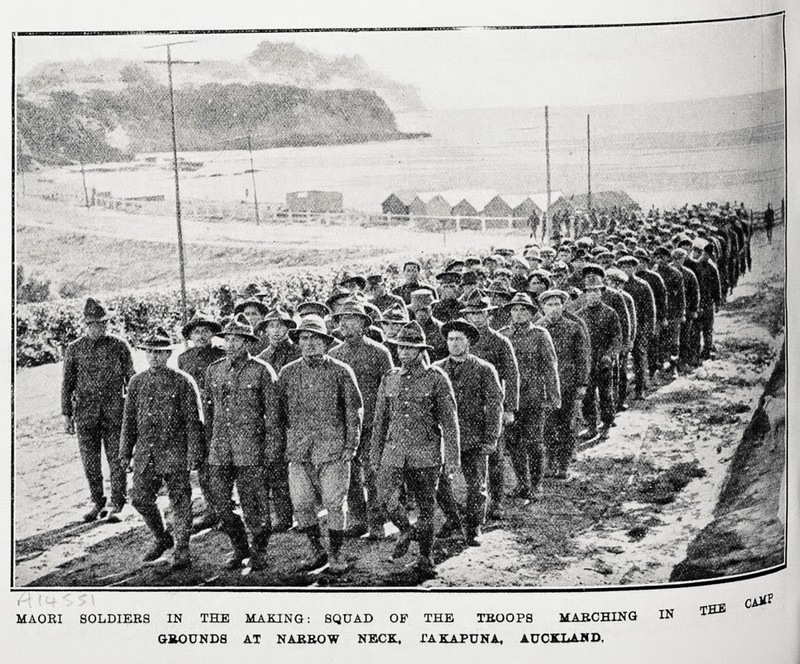 Many Māori served throughout the war in New Zealand’s provincial battalions, but it was largely through the vision of Ngata and Buck that Māori could be seen ‘winning their spurs,’ serving their bloody political apprenticeship and beginning the long march to political equality in New Zealand. The two companies of what was initially called the Native Contingent sailed from Wellington bound for Egypt on 14 February 1915. Due to patronising colonial attitudes, at first some British officials did not think Māori should fight in a European war; although very soon both British and French were using Indian and African troops. NZ’s Minister of Defence, James Allen, wrote to New Zealand Expeditionary Force commander Major-General Sir Alexander Godley saying ‘Although they are a coloured race I think it would be apparent on their arrival they are different to the ordinary coloured race’. However because of the small size of the Māori contingent and senior commanders’ scepticism about their battle-worthiness and ability to replace losses, Māori soldiers were sent to Malta as a garrison and labour battalion. This was not received well and many resented this inactive non-combatant role, but their officers realised they would have to accept the wisdom of the army and ‘to grin and bear it.’ Their turn in the firing line would come soon enough.